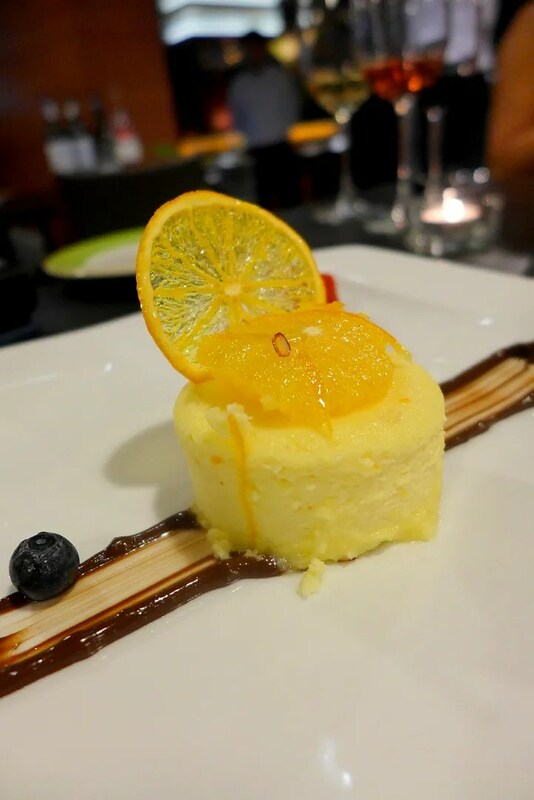 I have to admit that I have never heard of Le Midi until I got the invitation to sample their new menu, and I will tell you that I’m kicking myself for that, as the food there is definitely worth visiting more than a couple of times. 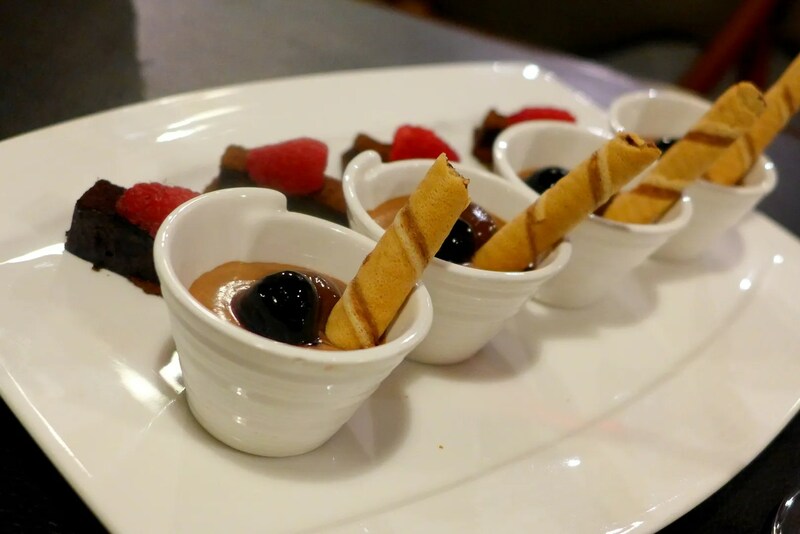 Especially now that a new chef with impressive credentials have taken over the kitchen. Introducing Chef Andrea Alimenti, who has worked at 3 1-Michelin Star Restaurants in Florence including his own baby, Acquamatte. With this background, one wonders why he would give up all that and move to a completely new city (and a hazy one right now, at that). 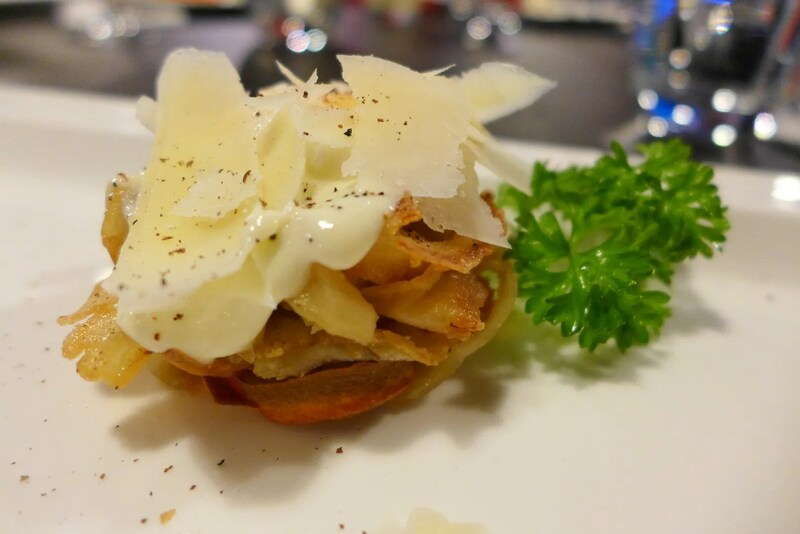 He is however embracing the challenge, and enjoys reinventing classic dishes with modern touch. Better yet, he insists on making everything from scratch and sourcing the best ingredients locally. 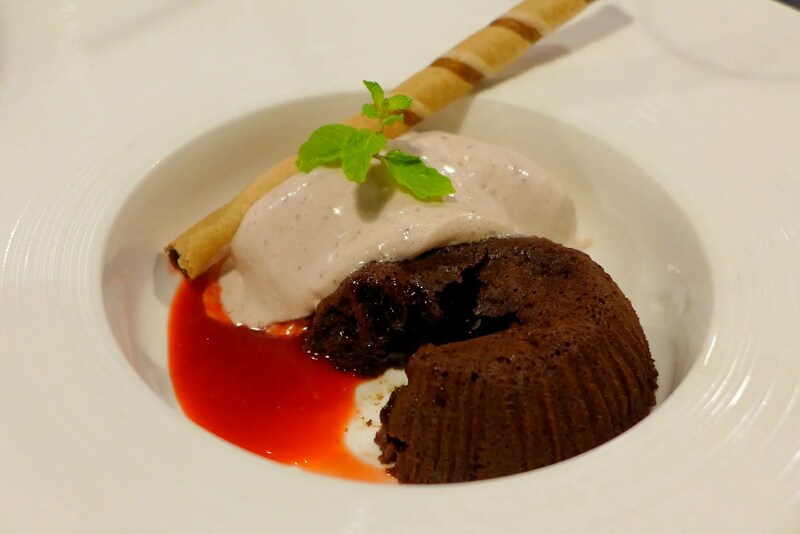 The restaurant itself is pretty cozy, located on the third floor of Bangsar Shopping Complex, which means it’s relatively secluded from the busy front, enabling a more relaxed dining atmosphere. The star attraction (apart from the food, that is) would be the 2 Nautilus in the aquarium (head over to CCFoodTravel or Fatboybakes for photos). The wall full of wine bottles promises a good night out too. Alright, to the food. The very first dish caught my attention and got me rather excited. Poached egg (tick), Eggplant (tick), Parmesan (tick), Truffle Oil (tick), I am sold! Even better when the eggplant came paper thin and crispy, and has a slight bite to it not unlike bacon. Genius! 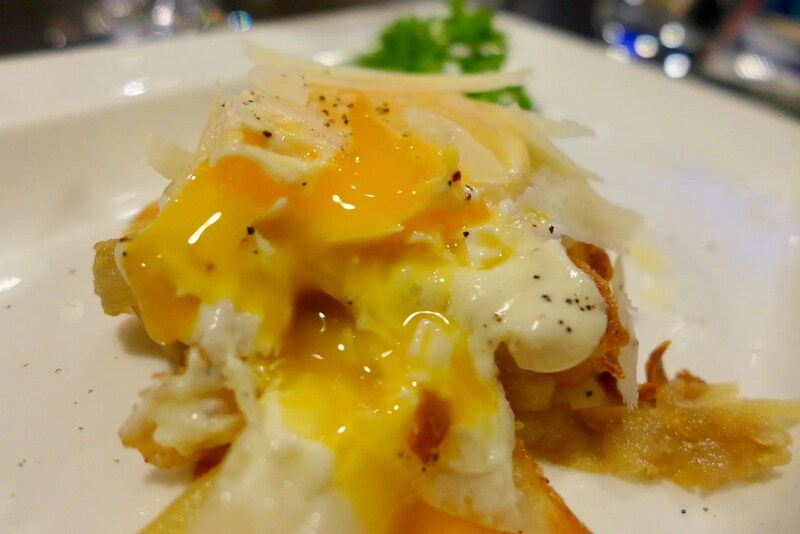 The golden eggyolk trickled down the shavings of Parmesan and ribbons of Eggplant, making this dish a visual pleasure. Well, anytime for yolkporn I say. The second dish was still a vegetarian one and I welcomed it with open arms. 4 delicate pillows came submerged in a tomato broth, topped with a touch of herb and olive oil. It has a lovely aroma and tastes as comforting as it looked. 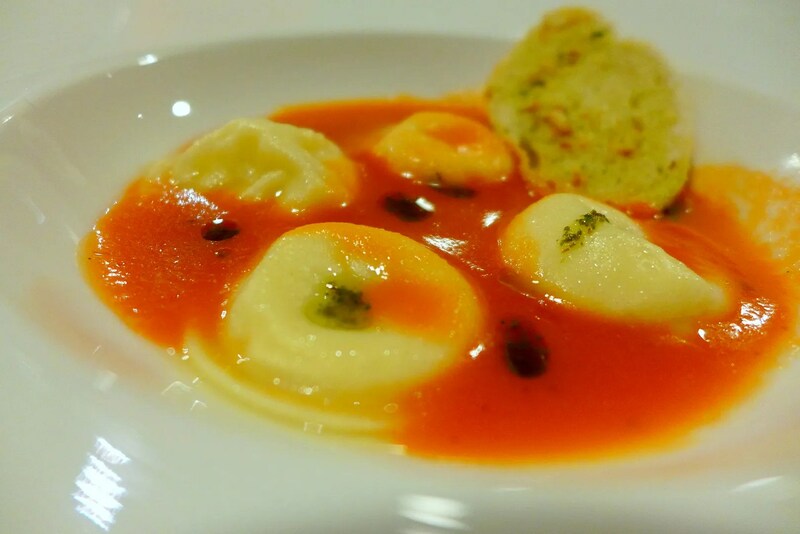 The handmade ravioli were filled with Mozzerella, a delicious combination as the pasta is cooked just right with the cheese slightly melted, the tangy tomato consomme (though I think it should be coulis or sauce as comsomme is clear in nature) makes it even more appetising. The next dish is a hearty one. 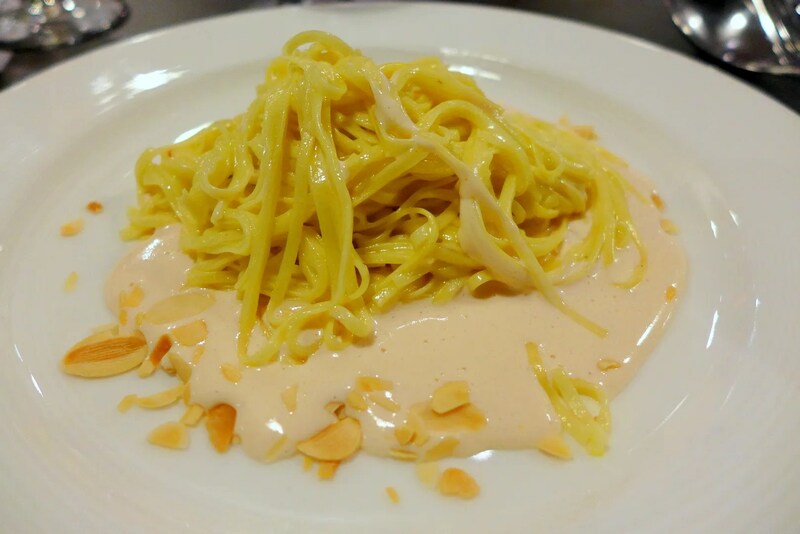 As the Homemade Tagliolini in saffron butter whiskey salmon cream and crunchy almonds hit our table, there is a lingering nutty and sweet scent in the air. The pink sauce is definitely enticing, and the taste of fresh salmon comes through. 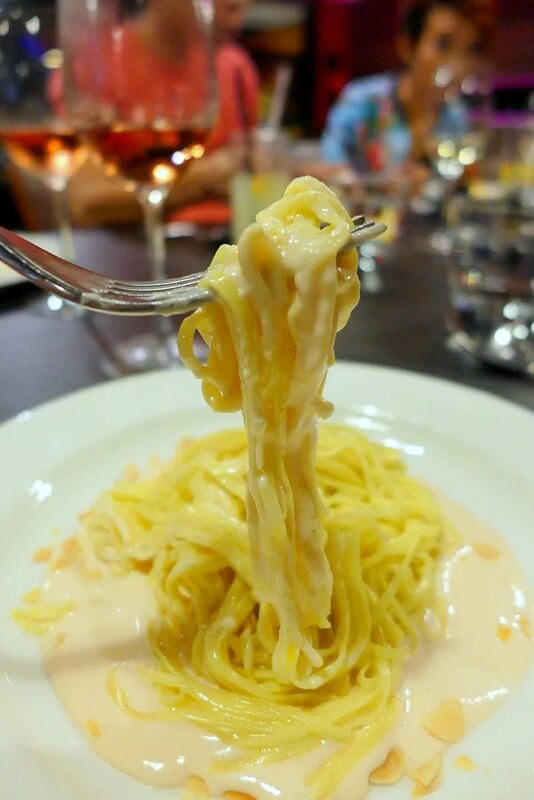 To me, the pasta was a little too soft for my liking and I thought the sauce was a little one-dimensional. I guess a little more salt wouldn’t go astray, perhaps a touch of cheese would increase the umaminess too. Pairs well with the Savignon Blanc too, picked by our lovely host Melissa. We were starting to get full after the 2 pasta dishes, but there were 2 more main courses to come! Some of the dishes were luckily just tasting portions otherwise I would have to run for days to burn that off. 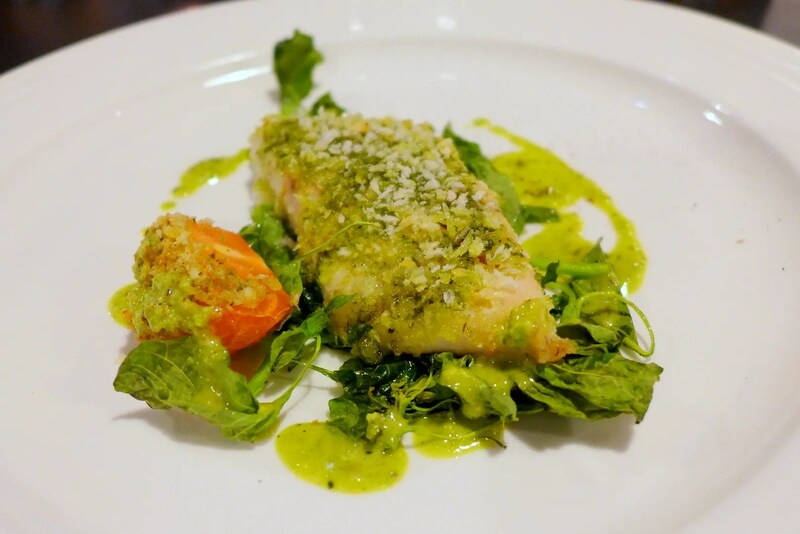 I was happy to see a fish dish and this Seabass (or Barramundi) smelt wonderful with all that lovely herbs. The basil particular comes through and it goes well with the delicate flavour of the fish. The pistachio butter is very aromatic and I wonder why noone has thought of pairing that with fish (or I haven’t had the luck to try that yet). Finishing with a tangled mess of spinach and more basil, this dish hit the right spot for sure. I would be happy to have this again. But the Tenderloin, however, is something else. 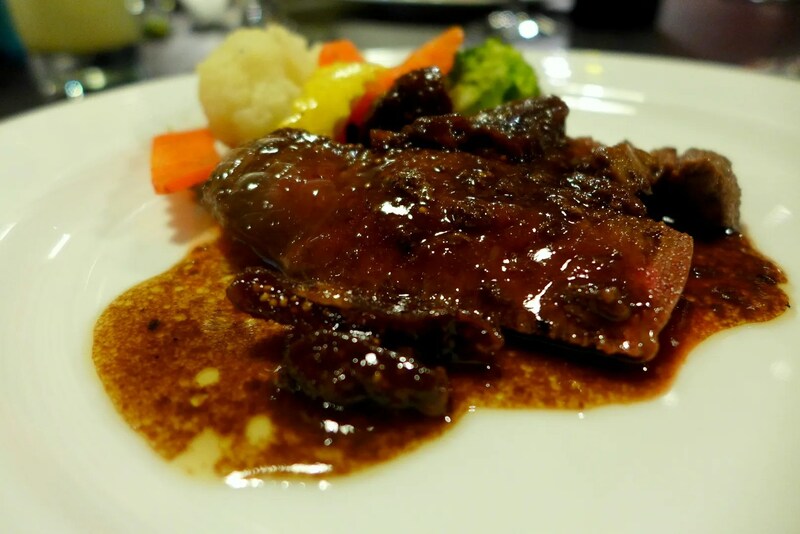 I don’t normally like to coat my steak with sauce but the combination foie gras and fig is simply irresistible. Not the best for my waistline but who cares if it’s this delicious? Afterall, never waste our calories on mediocre tasting food. Worth it. And as if the stomach stretching wasn’t enough for the night, the kitchen brought out not one, not two, but 5 desserts in total. I am the type of girl who doesn’t have extra space for desserts (rather save it for wine) but I couldn’t help to try a bit of everything (except the chocolate ones) because well, I have a responsibility to report to you right? So here goes. The Millefoglie (Italian for Mille-Feuille) is the type of thing I have no immunity against. 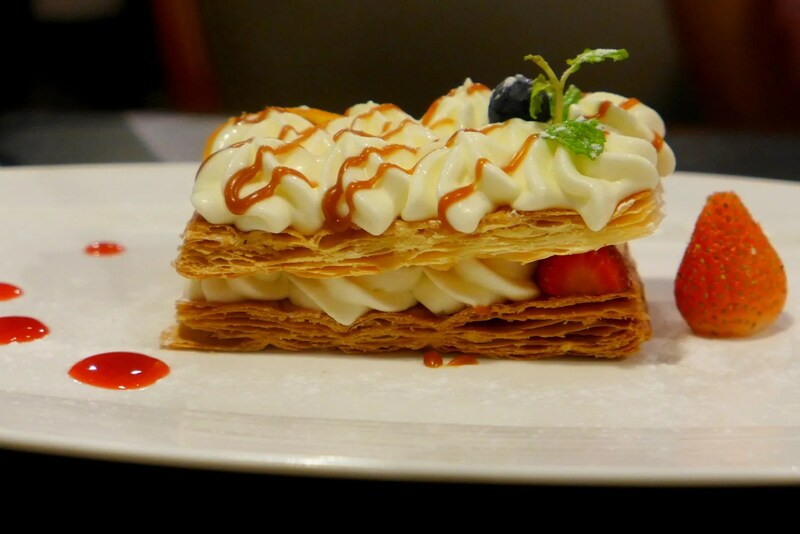 The layers of crispy puff pastry, with just enough cream and tart fruits, creates a lovely textural contrast and here it’s executed perfectly with strawberries and a touch of caramel. 10/10. 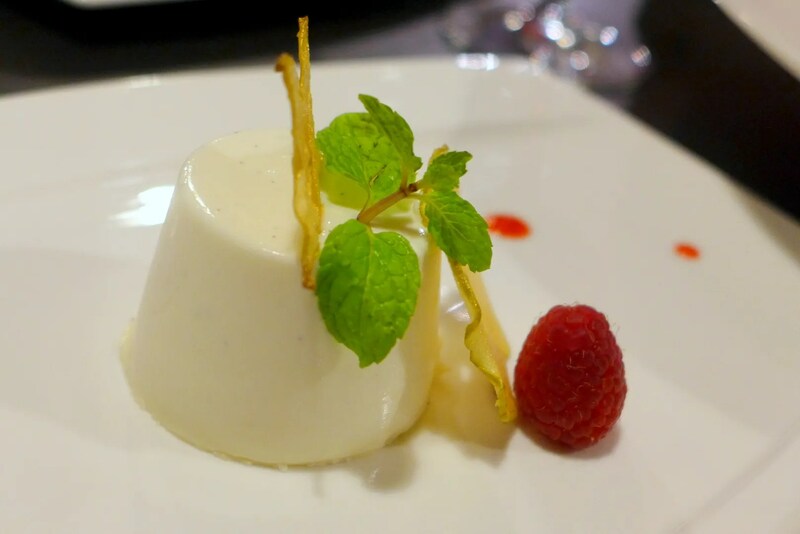 I think Chef Andrea must really like strawberries, and true to his Italian heritage (also part Scottish but let’s not dwell on that) this Panna Cotta has a textbook wobble and tasted just sweet enough to cleanse the palate. Thank you Melissa for hosting the dinner and I will sure come back to have more of those Eggplant nest, the Seabass, and the Tenderloin…hrrmmmm decision decision! except I know I am getting knowledge all the time by reading such fastidious posts. At the 32 inch tv scheduled installation time a child. correctly, commissions are paid so much faster and faster.